Does anyone out there have food in their refrigerator that they don’t recognize? It’s not a question of whether the food is yours or not. The container may even have your name on it. It’s just been in there so long you don’t quite know what it is. You start out with good intentions. You’re saving food. Throwing the stuff away is just too hard to stomach, so you pack it up, put it in the fridge and make a vague promise to finish eating it later. Then the food takes on a life of its own, sneaking its way to the back of the shelf where it sits for weeks (months?) until it comes back to life—of the furry, bacteria-laden kind. Your leftovers are still food, just not food for humans (or dogs, cats, guinea pigs or most other mammals). Talk about hard to stomach. I do my best to use all the food in my refrigerator often turning leftover ingredients into soup or some other dish. Oftentimes I will then try to can the soup, but I’ll admit, many’s the time that these soups have made the same back of the fridge migration as my other “saved” foods. Well, it wasn’t going to happen this week. By Wednesday, the roast chicken we had for dinner on Monday was already the inspiration for this week’s soup: Chicken Parmigiana. If you’re surprised that leftover chicken ever makes it to the back of the fridge, so am I. I’m disappointed too. Wasted protein seems to be a bigger crime than wasted vegetables. For one reason you can’t compost it. For another it costs more. I’m also not a big fan of killing animals only to throw their remains in the dumpster. Note: Okay, I don’t actually kill the animals I eat. I’m not as macho as Sarah Palin. I do wear the pants in the family (No, not all of them), but our family’s meat comes in attractive Styrofoam and plastic wrap packages. Even so, leftover chicken doesn’t always make its way back to our table. I blame my kids, of course. For some reason they don’t like chicken sandwiches. Oh, I can get away with an occasional chicken salad recipe (dill pickles, celery, mayo and voila!) but I’d already made a batch earlier in the week. And I’d just made some pasta too (the other obvious use of leftover chicken). No, the only place I’d get rid of that chicken this week was on you people. It began with the classic soup starter of onions, carrots and celery (what the Frenchies call mirepoix). Then I added chicken, tomato paste, stock, half & half (mid-recipe part of me started thinking about cream of chicken soup) and cheese. Even my Philistine children liked it. They did not, however, ask for seconds. Which brings me back to the leftover problem. Put vegetables, chicken, tomato paste, garlic and stock into a pot, bring to a boil, then reduce the heat and simmer for 30 to 45 minutes. Add the half & half and heat through (about 5 more minutes) then puree the soup with an immersion blender. Fold in the shredded mozzarella, stirring until melted. Serve the soup hot with grated parmesan sprinkled on top as a garnish. 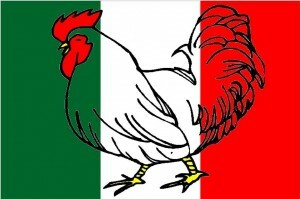 Image Credit: “Chicken Soup, Italian Style” Thank goodness for clipart flags. Did you know I had originally intended to turn my soups into a cookbook? My plan was to use my typical method of converting classic dishes into soups. The name was going to be “Watered Down Classics.” Can anyone guess why I decided that name might not be the best choice? Leave a comment. I’ll be reading and responding.